The World Wide Web is witnessing an explosion in new forms of online community. These are built on advances in Web content posting, social networks and the wisdom of crowds. However, we are still largely ignorant about the factors that enable online communities to react successfully to change. Change can involve a number of things: swings in membership and levels of engagement; the emergence of internal conflicts; changing relationships with other online communities and offline organisations; and increasingly, changes caused by new computer-mediated communication technology. This is significant because there are real structural problems with how online communities manage change. Though communication channels in online communities are inherently open, the channels through which management decisions are made and enforced are not. The management technology available for online communities reflects the centralized, specialist mindset of professional administrators of information and communication technology. Typically in online communities, the authority to manage communication channels also imparts authority over the social behaviour of the community. Management decision-making in online communities is therefore highly centralized, which restricts the participation of the broader community in reacting to change. The viability of a community is therefore precariously dependent on the competence and good grace of the individuals concerned. Researchers at the Knowledge and Data Engineering Group at Trinity College Dublin have recently completed the development and evaluation of a ground-breaking mechanism for collective management decision-making in online communities. Their approach uses progressive grounding of a rule-based model. This advances a collective approach to managing change as a means to building viable online communities. The system developed is a novel specialisation of policy-based management, termed Community-Based Policy Management (CBPM). With its novel use of self-defining groups as the fundamental structural abstraction, CBPM differs from previous policy-based management approaches that use the centrally defined roles typical of existing access control systems. A group is simply established by a set of people engaged in a shared activity. By defining subgroups and federated groups through explicit mandates for exercising decision-making authority, an organisation of self-managing groups can be formed around the evolving needs and experiences of an online community. These mandates can be progressively grounded as patterns of authority change, or as new models of resources or context emerge, and their impact on the distribution of authority is captured. By controlling the interconnection of different social and IT management rules between groups, the portion of an organisation's current rule set that collaborating decision-makers must understand is restricted, thereby making collective decision-making more scaleable. This also delivers fast runtime policy rule checking. Clear provenance of rules ensures that when policies authored in one part of a community clash with policies or goals from another, the causes of the conflict are immediately identified, thereby quickening their resolution. Group structure and policy rules are explicitly modelled, and as a result, policy conflicts and the parties necessarily involved in their resolution can be identified. This enables online communities to actively reflect on their management processes. The Indymedia network (an online network for global news reporting that is independent of large news corporations) was selected as a case study for CBPM. The Oscailt Content Management System, which is the Indymedia community server, was modified to enforce all access control decisions according to policy rules. The organisational form of the community was tracked over a year, during which time CBPM proved able to accurately model structural changes. This illustrated that CBPM possesses the power to manage changes in the distribution of authority and to resolve problems in organisational structure through detection and analysis of policy conflicts. The explicit, declarative nature of the policy rules, when aligned using CBPM to the structure of community, was therefore shown to support reflection upon that structure by its members. 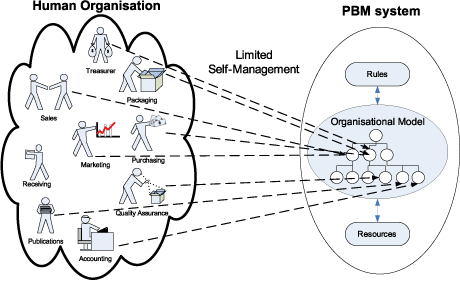 Figure 1: Policy-Based Management (PBM) using a group-oriented organisational model. Future work will develop further visual, interactive Web-based tools for reflecting on organisational structure, resource semantics and the existing policy-rule set. This will empower online communities to move from mere discussion fora to viable, value-generating organisations. Such empowerment has the potential to radically enhance the role of online voluntary associations: in non-profit activities, in public policy deliberation, and in broadening the inclusive management of public bodies. Similarly, the approach can support devolved decision-making and an agile team working in corporations or commercial virtual organisations. Such use of CBPM will bring into sharp focus the dynamics and distribution of power in online organisations, and will highlight how strategies can evolve for balancing control and trust in achieving shared and competing goals. Ultimately, the explicit modelling of successful strategies will facilitate the definition and reuse of online community management patterns. Further CBPM applications are being developed using a Web service implementation. It is ideal for applications where resource ownership, and thus decision-making authority, are necessarily diffuse. Integrated applications include Ubiquitous Computing under the M-Zones project (www.m-zones.org), and now the NEMBES (www.nembes.org) project and Dynamic Spectrum Management under the Irish Centre for Telecommunication Value Chain Research (www.ctvr.ie).